Did you know that you can use all of your company vehicles to advertise your business? Even if your work van, truck, car, or even boat is only used to transport equipment from one of your facilities to another, you can still build name recognition on the roads of Greater Orlando by using vehicle graphics. 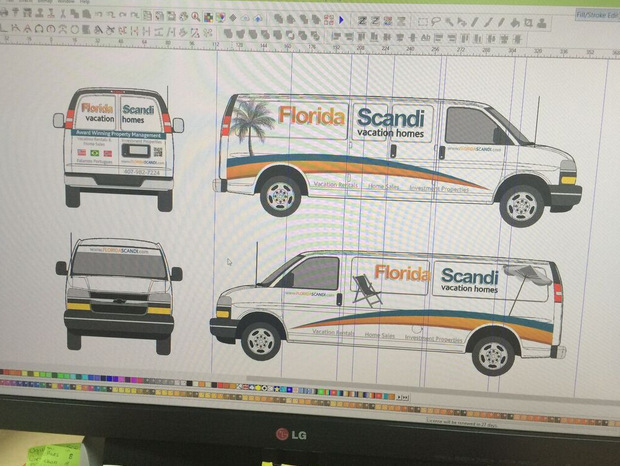 Florida Scandi realized this, so they contacted Citrus Sign Studio for van wraps. Located on West Irlo Bronson Memorial Highway in Kissimmee, Florida Scandi is short for Florida Scandinavian Vacation Homes and Management. They manage and maintain vacation home properties in the Disney Corridor. They pride themselves on providing families with clean, beautifully maintained, professional, and secure furnished vacation properties. They have a unique team of domestic and Scandinavian employees with experience renting and managing 500 townhomes, single family vacation home properties, and condos. 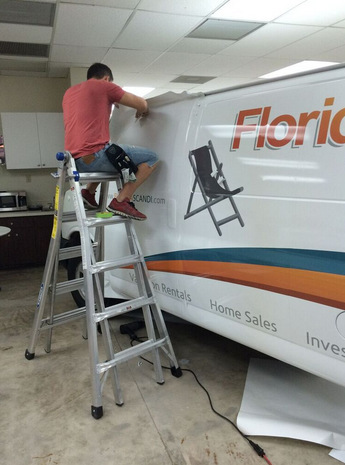 When an organization that provides so many families with a quality vacation experience came to us for van wraps in Kissimmee, FL, we were more than willing to help. 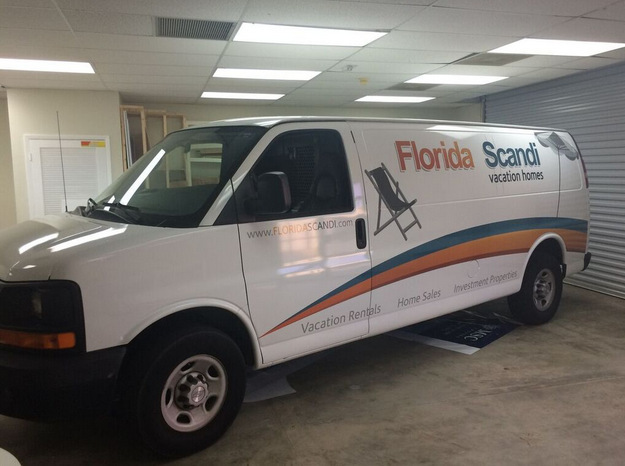 Florida Scandi has a large conversion van that they use to carry tools and equipment to perform property management tasks at the many vacation homes they oversee. They wanted to help their branding as they traveled around town. Fortunately, we had the perfect solution. After an initial consultation, we had a good understanding of Florida Scandi’s goals for the project. Our graphic designers were excited to get started on the wrap because they were given so much real estate to work with. Once the client approved of the proofs, we got down to work printing the wrap on a top-quality vinyl film and laminate. 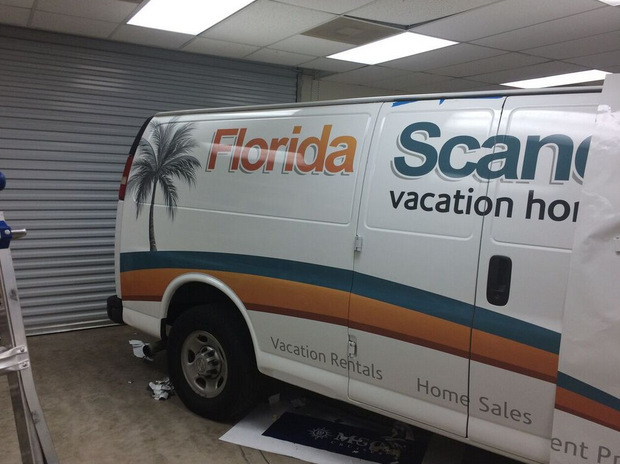 Once the wrap was ready, we worked with Florida Scandi’s schedule to install it at a time that worked for them. For full wraps, we may need the vehicle for up to a day to get the installation just right. As you can see, we put a lot of care into our installation process to make certain that the wrap will continue to look great for many years to come. In the end, the wrapped van perfectly represents the Florida Scandi brand. Their logo is prominently featured on the sides and rear along with a list of some of their services. We included more information on the back because motorists have more time to look at the rear of the van when stopped at red lights or stuck in traffic. Even along the top of the windshield, we added their website address. Overall, our client was completely satisfied with the job we did. 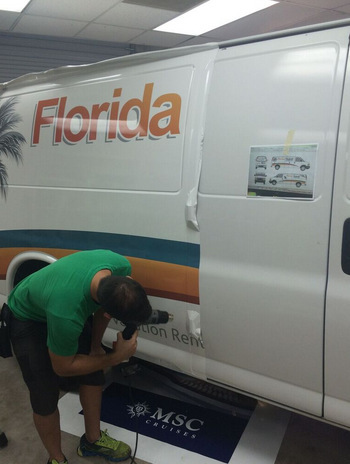 Whether you need shuttle van wraps in Kissimmee, FL to transport vacationers from the airport to your properties or you just have a fleet of maintenance vans, we have graphics solutions that fit just about any budget. From simple standard vinyl lettering to full vehicle wraps, we do it all. If you are interested in using your work vans to advertise your business 24/7, contact Citrus Sign Studio today for a free quote.